The New York Times has a fairly ignorant error in a graph on the front page of its business section today. 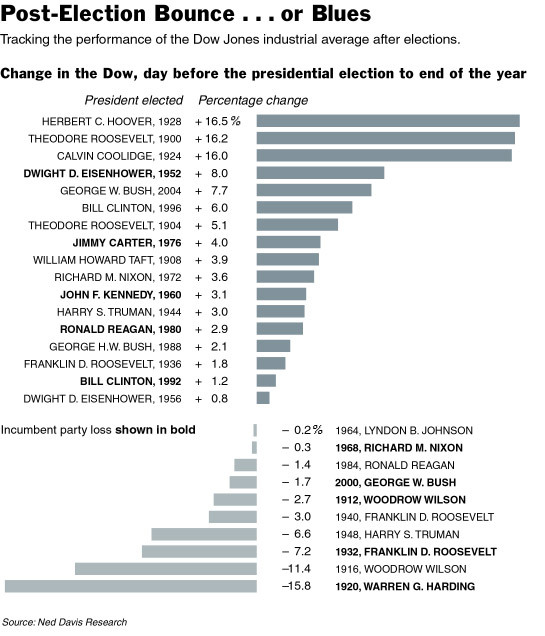 Accompanying an article about the stock market's late rally, the Times gives us this helpful chart showing the change in the Dow Jones Industrial Average between the Monday before Election Day and the end of the year for the last 27 presidential elections. Harry S. Truman was elected President in 1944? That's news to me. If one were charitably inclined toward the Times on this fine New Year's Day, one might give it a pass. I suppose that their starting lineup isn't on duty on New Year's Eve. Before the presidential election, the Dow and the Nasdaq were down for the year, while the S.& P. was up just 1.7 percent. 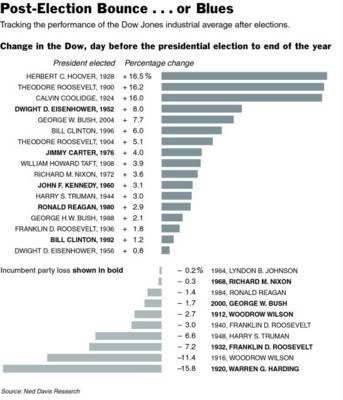 The 7.2 percent surge in the Dow after Nov. 1 was the fifth-best postelection rally in a presidential year since 1900 and the best since 1952, according to Ned Davis Research. For the Nasdaq, the 9.9 percent postelection climb was the second best since the index began in 1971 and the strongest such rally since 1992. Indeed, by using the day before election day as the benchmark, the Times is understating the absolute strength of the Bush election rally. The DJIA actually turned up explosively on October 26, rising almost 140 points, and never looked back (the Dow rose every day between October 26 and November 9 except Election Day, and it only went down that day because the market closed before people understood how profoundly wrong the exit polls were). If you calculate the Bush election rally from that date, the rise in the DJIA has been 10.6%, which is 47% larger than the number reported by the Times. You have to look very carefully whenever the Times starts spewing numbers. Also, Theodore Roosevelt was not elected presient in 1900! Great catch! I am ashamed and humiliated that I missed that! Ok, OK, Truman was elected Vice President in 1944. Not really enough to throw off the chart is it? Nitpicking! And your boy Bush looks pretty good in the stats depicted on it! Congrats I hope he and you have a sucessful New Year. What a completely irrelevant chart. Does this actually reflect anything useful? Needed? Why don't they simply produce a chart that shows how eeeevvvvvviiiiilllll Bush is? It would have just as much relevancy as this one. "You have to look very carefully whenever the Times starts spewing numbers." Amen. I'm an actuary. I have written a few times regarding dreadful statistical analyses done by Times reporters. One was a huge analysis puporting to show that eliminating the death penalty doesn'tn increase the murder rate. In fact, the data isn't conclusive,m but an honest appraisal would have found a corellation. Apparently theTimes doesn't have an editor with the ability and desire to maintain ingtegrity and standards in data analysis. This is just an article that goes on for a long time but actually says nothing. Herbert Hoover's election had the best post-election rally, and during his presidency we suffered the worst economic disaster in our country's history. It's just like you said in your post, only the New York Times' worst writers were working last night, everyone else was at New Year's Eve parties. I think I'm going to write about this at my Libertarian Girl blog. This really is stunning. I'm going to send your whole piece to Okrent. TH, I linked to you. Using proxy DJIA monthly from 1790 (per Center for Cyclical Research), we determine that positive market returns occur in a majority of Presidential election years. For such positive years, the average gain is about 8.50%. Aggregating year-end 2004 gains in the Dow Industrials, S&P 500, and NASDAQ, we obtain almost precisely this figure. Notice that this is not a partisan phenonemon, but a reflection of investors' uncertainty regarding economic outcomes linked to post-election political policies. In 2004, domestic equities markets bottomed in mid-August, and climbed steadily thereafter on strength of sentiment that tax cuts would not be repealed, that Social Security reform was at least discussable, that U.S. forces would not abandon stability-enhancing efforts overseas. Long-term market trend-analysis is not as subjective as it may appear. Though in any given case, projections are subject to anomalous developments, as a whole, over time, American cycles and patterns have proved remarkably stable. And why not? An entire literature explores various motifs; for myself, as a "quant model" trader treating index aggregates on a parametric basis, may I say that "taking wing" requires knowledge not of ornithology but of aerodynamics. As to what constitutes "knowledge", my response would be: Ask yourself, first, what a "market" is; then ask how "markets" act; finally, explore the simplest of all possible means of identifying trading vehicles' "inflection points". The mechanics are relatively simple, but concepts are subtle indeed. Hint: Lewis Carroll is relevant, as is Benoit Mandelbrot. Endless fascination!-- know your limitations, and proceed thencefrom. "You have to look very carefully when the Times starts spewing numbers." Dude, an Instalanche AND a Powerline-lanche in the same day? I wonder how many more nails in their coffin they can stand. The iron lady has rusted to nothing and I, for one, really feel bad about it. When I was a young boy, we watched the evening news and read the paper to find out what is happening...and, they, I am sure, slanted the news to their views. Only then we didn't know it. Thanks to the blogs, we now do. Thank you for your collective vigilance, we all now can really know. Of course, I believe that we (the blog readers) have also learned to now check the bloggers facts as well. Thank you Al Gore(LOL)for the internet. The NY Times chart was supplied by Ned Davis Research. At their website they seem quite proud of their charts. Apart from picky little errors of historical fact, it's a pretty interesting chart. The Ned Davis guys are market quants, not journalists, so if they write "Harry S. Truman" when they should have written "Franklin D. Roosevelt," I'm not going to take issue with it. That the NYT uncritically republished it is hilarious, though, given the MSM's bleating about insufficient accountability in the blogosphere. What accountability was there here? Now you might say that it is a small error. True. The more interesting question is why a Times business reporter wrote a story that quite intentionally lopped off the first three or four trading days of the Bush rally? Even if the ready-made chart made it convenient to measure the rally from the day before election day, the story would have been more credible if it had added a sentence that showed the much greater impact of the Bush rally if it had been measured from its true starting date. What a load of egregious codswallop. The typo of placing Truman in 1944 is certainly a muff, and it was made by whoever printed that chart from the company that did the research - some sub-editor at the Times missed it. Of course he's lucky that he has such a devoted legion of 'slavering hacks', to use Henry Farrell's now famous but astonishingly accurate phrase, devoted to nitpicking at the Times' coat-tails - it's nice to have typos corrected. To imagine that this is anything more than a typo though is quite the height of stupid hubris. Which publication hasn't had typos? Just read this very blog, you'll find buckets of them. The Times makes no claim that they are The Paper that Never Makes a Printing Error. They are the Paper of Record, and they do a damn fine job of it, all things considered - although the things they do right, so often, so much, will never ever be acknowledged by the wing nut gallery, whose barometer for quality is whether or not the media outlet spews the GOP party line always and unendingly. It makes one sick. I've never seen the wing nut gallery condemn FOX for its astonishingly regular outpouring of errors and mischaracterizations. Where does the vaunted concern for truth, fact and justice disappear to then? Partisan hackery is fine, as long as the people indulging in this prostitution are aware that that's what they are doing, and acknowledge it. But it's silly to pretend that the hackery arises from some sort of noble calling to correct sins for the sake of truth and truth alone. Someone who was truly that honest will never shrink from thrashing Fox just as readily as they thrash the Times. Because if you claim that your motivation is for accuracy, and truth, and non-bias, by definition you cannot only direct your actions toward only one side, in accordance to your biases. If a blogger refuses this fairness, then he must be willing always, if he has at least that honesty, to forthrightly say "Every time I bash the Times (or Fox) I admit I am doing it not because I value truth - I do it because bashing one side in accordance with my partisanship furthers my political/partisan/ideologic motivations". The recent call by Noah Millman is something really worth supporting. It's so refreshing to see an honest guy take a stand against his fellow ideologues in the interest of true principle. It is too rare in the blogosphere, too rare... it is daily just infected with such enormous amounts of crap - from both the right and the left that I think they are daily descending into a a worse pond of scum than they accuse the MSM of going into. The kicker is they don't realize it. Lastly, TH's only other point, on the magnitude of the DJIA rally, perfectly demonstrates the valuelessness of this sort of hackery. If I understand correctly, he seems to be suggesting that this years election rally was very significant because if you count it not from election day like it was counted for everyone else, but from a week before , the rally was worth 10.6%. He then seems to suggest the Times has been gravely unjust - "this is actually 47% larger than the Times figure!!!1111one!!11!!one11! ".Well, doh. Of course. The conditions were just changed, and we're not comparing the same thing anymore. If you want to make an honest comparison, go back, trawl through the data, find out the earliest sustained pre election rally for each of the elections in the chart, and then post an analysis. Only then will you know where this years rally stands, by your new terms. It will be truly absurd to trumpet this 10.6%, if in actuality it is nothing special compared to previous elections. Or worse, for all you know it might be one of the worst. Finally, the characterization of the Times' reporting of the Bush figure as "grudging" is glaring. There is nothing in that sentence that is at all grudging, but it is convenient for your ideological purposes to erect a strawman and then proceed to knock it down. I was going to remove that word 'stupid' but hit publish instead of preview. In clarification, I am not calling anyone here and certainly not the author of this blog, stupid. When i wrote the post i wanted to say the hubris I am talking about is particularly "negative". I should have used another word because this one lends itself too easily to misunderstanding. My sincerest apologies to anyone who takes offense - I didn't mean it that way. The "Truman error" is not a "typo". A "typo" is a typographical error, which happens when somebody types the wrong thing, or omits a word, or misspells a word. And yes, there are many of them on this blog. Typos do not trouble me. Indeed, the "Truman error" does not trouble me. It amuses me. It amuses me because it suggests that the NYT really does not do much to verify the information that people feed to it. That doesn't make the NYT either incompetent or immoral, but it also suggests that it is in this respect no different from a well-run blog, but with infinitely more resources. The Times has several people who read each article, and they are all much more experienced journalists and fact-checkers than I, who am but a rank amateur doing this in my spare time and often half in the bag to boot. You'd think that the editors at the Times, even those on duty on New Year's Eve, would know who was elected president in 1944. Now, I have never claimed that my motivation in writing a post such as this is for accuracy, truth, etc., as you charge. That is a strawman. Of course, I certainly do not aim for the reverse -- inaccuracy, falsehood, and so forth -- but neither accuracy nor truth are anything other than fortunate byproducts of my efforts here. My purpose is to amuse myself, and my ego is gratified that there are those who read what I write. Am I different in this than any amateur blogger? So why do I pick on The New York Times and not Fox? Several reasons, I suppose, but the most important is that the Times gets dropped on my driveway every morning, so it is the thing I read. I do not purport to be a media critic by specialty. I am a blogger reacting to something that I have read, and I read the Times more often than anything else. I strenuously disagree with your argument that "[i]f a blogger refuses this fairness, then he must be willing always, if he has at least that honesty, to forthrightly say 'Every time I bash the Times (or Fox) I admit I am doing it not because I value truth - I do it because bashing one side in accordance with my partisanship furthers my political/partisan/ideologic motivations'." There certainly are partisan bloggers who do their share of media-bashing from all perspectives (Atrios, for example, raises money for Democrats and does a great job of bashing Fox, and he has counterparts on the right). I am not particularly partisan, although I am definitely center-right libertarian and I did hold my nose and vote for Bush this time around (it is a matter of record that the only candidate to whom I gave money in the last cycle was Howard Dean, but only because a friend asked me to). You see no "Blogs for Bush" button on this blog, and I have harshly criticized Republicans on numerous occasions. Frankly, I tend to pick on liberal publications like the NYT because I'm simply better at it. My antennae are more sensitive to "Times liberalism" than "Fox conservativism," and I'm more familiar with the arguments on the other side. I suppose that if I had more time I would read more stuff and write more criticism and some of it would peck away at Fox or other conservative outlets, but like most bloggers I only have the time for a couple of posts a day so I shoot at whatever comes across my sight. I think you misunderstood -- or I wrote poorly -- my point about the picking of the starting date of the Bush rally. I do understand that for the part of the article comparing post-election market trends it would have made no sense to start the measurement date on October 26. However, the article had quite a bit more in it than the few graphs comparing this year's post-election market with those of other elections. There were many paragraphs of commentary about the state of the market, and what it may do in the coming year. Is there any doubt that the article would have been improved if a sentence had been added to explain that the Dow took off on October 26 and rose every day but one for two weeks? Indeed, even ignoring the political considerations it would have been a better article if it had made that point. As for your last point (about the sentence in question not being "grudging"), I suppose I may have chosen a poor word. In any case, I agree that there is nothing about the particular sentence being grudging. The rest of the article, though, goes to some lengths to explain the huge rally in the stock market before hitting upon Bush's reelection as a possible reason, when I think it is widely accepted that the growing likelihood of Bush's victory touched off the rally on October 26 and the fact of his election sustained it well after election day. Indeed, that the only day the rally faltered was during the exit poll confusion on Election Day is powerful evidence that market longs were pulling for Bush, even if you don't really get that impression from the Times article. Whether or not my use of the word "grudging" might have been improved upon, it was hardly a "strawman." Hi, I was just out blog surfing for detailed info on self confidence when I ended up on your page. Obviously I ended up a little off base, but I am certainly glad I did. If you wouldn't mind, I would like to post your link on my "favorites" page. Should you ever need it, there is valuable information on my site about self confidence. I really enjoyed all the great information on your **keyword** blog. it from my website about facial hair removal Would love to know what you think. I have a Free site Free Article Search. It pretty much covers journal article related stuff.